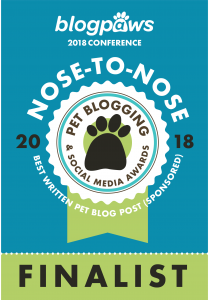 We're three Southern Sweet and Sassy ladies who live in South Carolina and our blog is focused on the daily lives of the two cats who live here, Truffle and Brulee, and Mom Paula. Mom Paula began blogging in June 2008 as a way to escape her stressful job and to chronicle the daily life of Sweet Praline. When Praline left for the bridge in 2011, Mom Paula began a new blog for the two new kittens coming into her life. The name Sweet Purrfections came from research and previous experiences with Persian cats. Sweet was used to honor Sweet Praline and our Southern dessert names. Purrfections came from a combination of purr, confections, and perfect. We hope everyone who visits our blog will leave with a smile as you share in the daily lives of our little family. 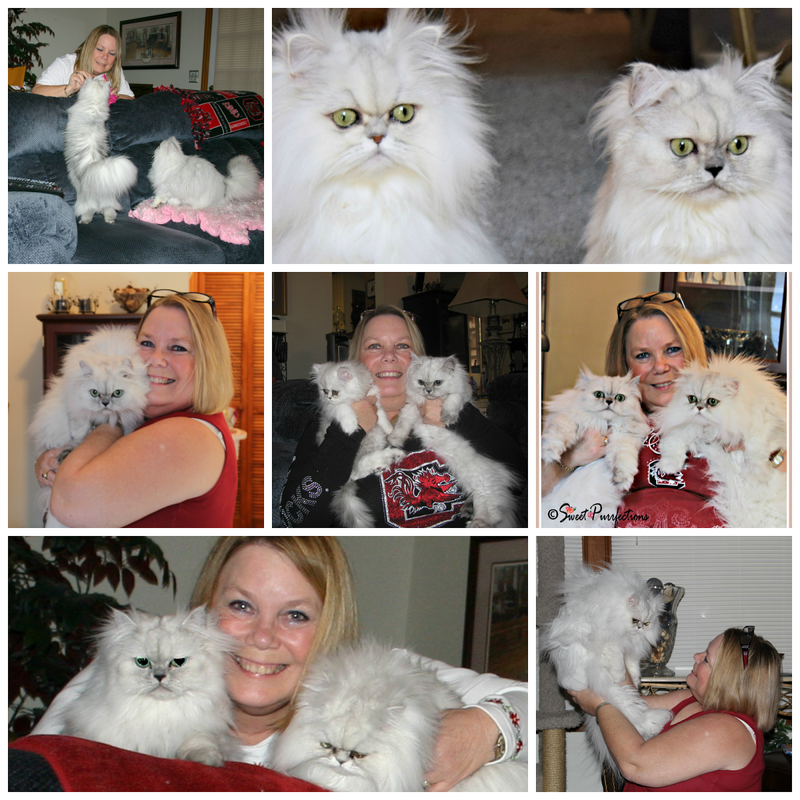 Our blog shares information about cats, cat products, stories, and photographs of two beautiful Silver Shaded Persians. We also share information about our extended family members' dogs and cats. 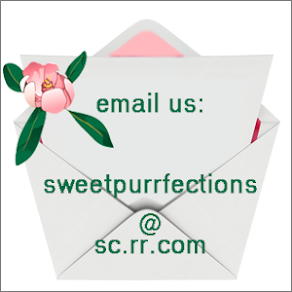 You can reach us at sweetpurrfections@sc.rr.com. Truffle was born June 2, 2011 in Mt. Pleasant, SC. Truffle is a female Silver Shaded Persian She came to live with Mom Paula September 4, 2011. Truffle is a petite Persian with a big personality and bright green eyes. She loves cat nip and silvervine and tends to be a little aggressive when high on the nip. She will eat almost anything, but loves treats and will pull your hand down to her mouth in order to get the treat. Truffle can be identified by her black heart-shaped nose and darker silver shading in her fur and on her face. Truffle's nicknames are Little Girl, Beautiful, and Stinker. Brulee was born August 27, 2011 in Mt. Pleasant, SC. Brulee is a female Silver Shaded Persian and is the half sister to Truffle. They have the same daddy cat, but a different mommy cat. Brulee came to live with Mom Paula November 4, 2011. 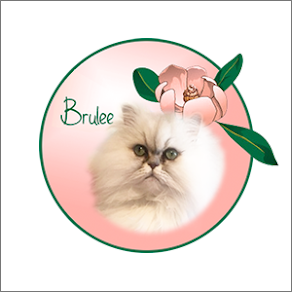 Brulee is a cobby Persian with long and luxurious fur that is the consistency of cotton. Brulee has the standard brick red nose outlined in black and green eyes. Brulee has a cute and quirky personality. She is shy at first, but likes to be where everything is happening. She prefers resting near Mom Paula, but will go wild when the wand toys are brought out. Brulee's nicknames are Cutie Pie and Sweetie. 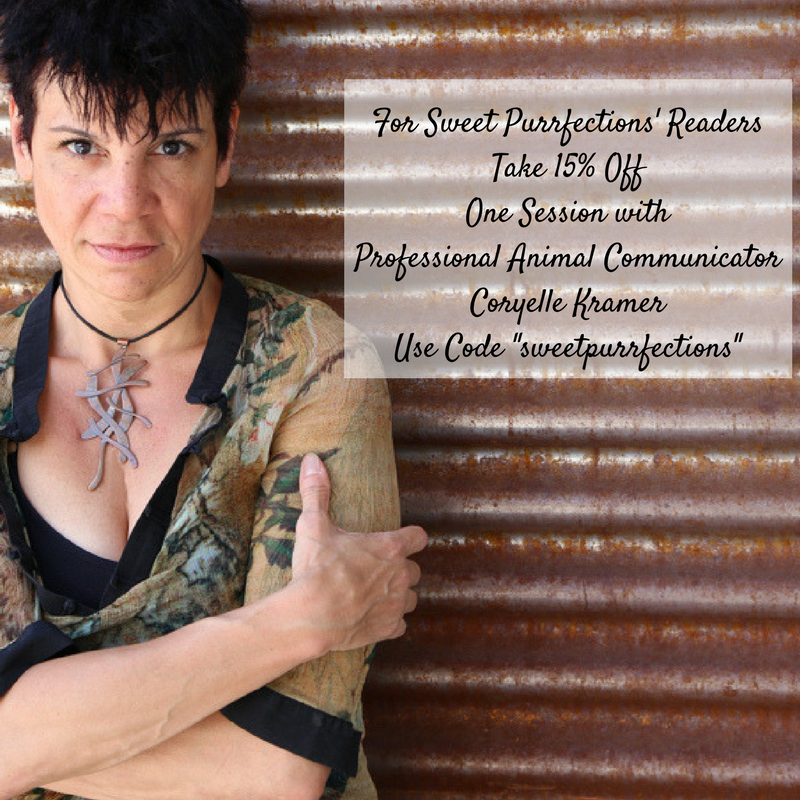 I am Paula, the voice behind Truffle and Brulee on Sweet Purrfections. I earned a Ph.D. in Secondary Mathematics Education from Clemson University and spent 40+ years education and government. I am the owner, author, & photographer for Sweet Purrfections, LLC. I've published several articles on mathematics education and full-color weekly planners related to cats. 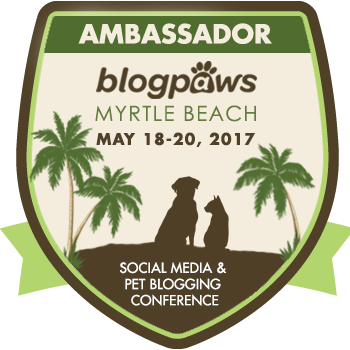 I am a pet influencer with BlogPaws and Chewy.com. 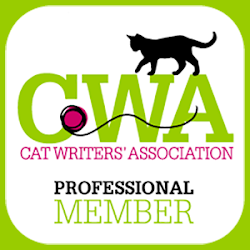 I am a Professional Member of the Cat Writers Association and currently serve as the Vice President. I've received a Certificate of Excellence from BlogPaws for Best Written Post: Sponsored and a Certificate of Excellence from the Cat Writers' Association for the 2018 Blogging Cats Calendar. I serve as the Managing Editor of The Cat Blogosphere. I began blogging almost 9 years ago in 2008, as a way to escape from the stress of work and to tap into my creative side because the majority of my work the past 20 years has focused on research and policy. The blog became my escape from reality as I was able to express myself through my previous Persian, Sweet Praline. 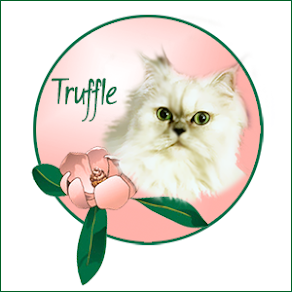 I started a new blog for Truffle and Brulee after Praline died from cancer. I posted something every day from June 2008- June 2018 without missing a day. 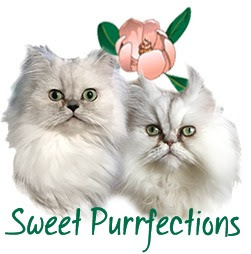 I recently rebranded Sweet Purrfections to focus on Living and Learning with Persian Cats. I love sharing photos, stories, and experiences of my beautiful girls. Interested in a product review? Sponsored post? Brand ambassadorship? I love reviewing new and different products with the cats. 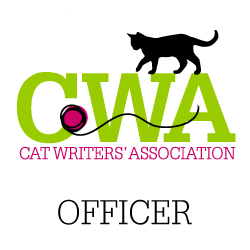 If you are interesting in working with us to promote pet related products, we'd love to talk with you. 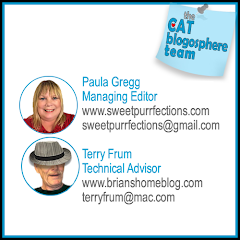 Contact us at sweetpurrfections@sc.rr.com for a quote and details about our reviews. If you'd like to see a sample of our reviews, click on the Product Review tab on the top of our blog. Each product review features original photography of the girls with the products and an honest and researched narrative. Our reviews reflect the attitudes of the girls and tell a story that relates to our Southern Sweet and Sassy personalities. We respect the FTC's Revised Guidelines and will inform our readers of compensation and products received. Mom got all excited when she read about Truffle. Did you know that Truffle has the same birthday as Steinbeck? Of course he was born in 2016 so he'll just be turning one next month. However, I'm Hemingway and I'm a big boy kitty who is 6 1/2 years old. Mom tries to keep us busy updating our blog but sometimes things fall through the cracks. (That's her excuse, anyway.) Nice to meet you.